Most of the people who using the Facebook regularly will not believe that they can earn using their Facebook account and its related services quite easily. 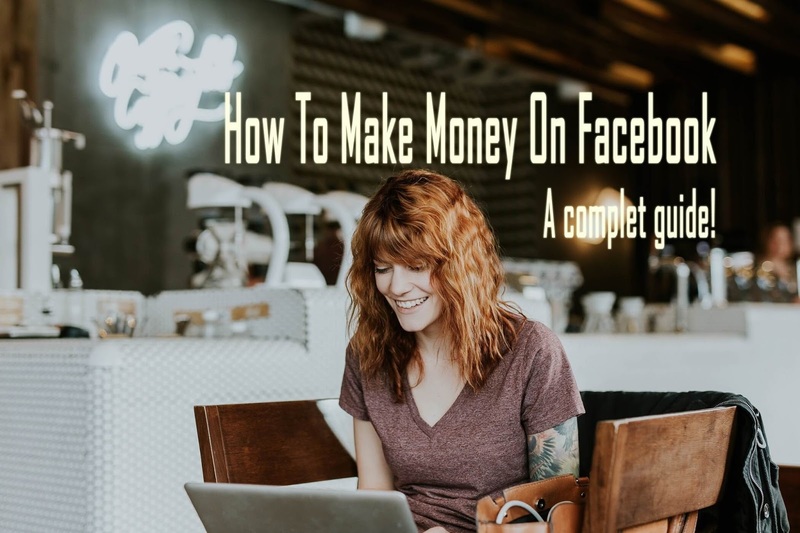 Although, Facebook is not providing any direct methods to do so, still there are some real and working methods by which you can convert your Facebook account and its related services as a money making tool. Please note that, don’t, judge anything before reading the whole idea. First read, and then use your brain and effort. ➤No.1. Selling On Facebook: Although the Facebook is not an eCommerce site still, you can sell almost anything using Facebook in many different ways. If you’re connected with any Facebook group then you probably noticed that there is a button called “Sell Something” right on the top of post creating section. Navigate- more ⏩ Sell Something. 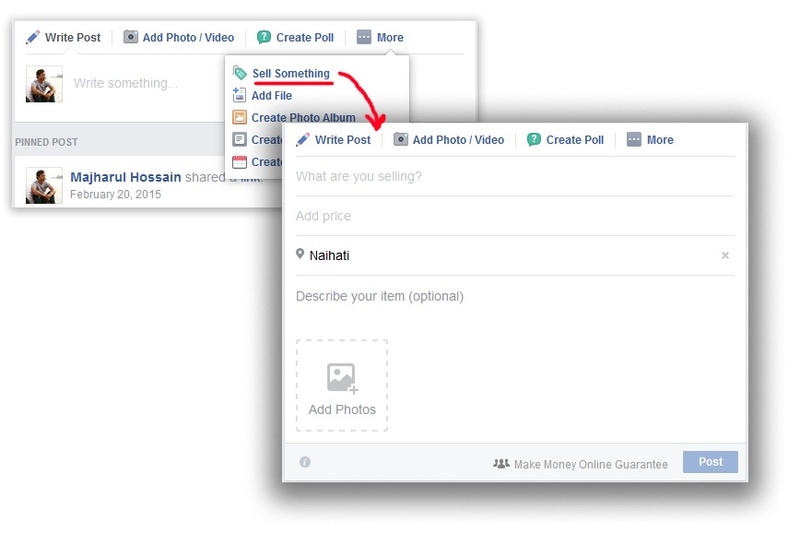 By utilising the button you can sell a group related products on Facebook very easily. Join Buy & Sell type groups which has at last 20000 members. Closed groups are the best for serious business. Try to sell only the products which are mostly not available online (such as homemade products). Keep responding to the comments. Give details as much as possible. Always put genuine pictures of your products. ➤No.2 Create Popular Groups: The Facebook group is the key to promote anything over Facebook. If you own a group with huge members then, you can easily produce a group related products/services in front a large number of potential customers. So that it’s easy to sell using the Facebook group than any other online platform. Not only physical products, Facebook also works fantastically well for call to action types business like paid services. You can generate thousands of phone calls by sharing (to the relevant groups) a single post on Facebook. I don’t know it’s OK or not but, many people selling Facebook groups for a large amount of money once their group get huge numbers. If you are the admin of your group then, pin your post/offer on the top that everyone can see the offer first after entering your group. Don’t let people post irrelevant things on your group. Don’t let people report your profile. If you want to join another group then always choose close groups with huge members. Public groups are not good for serious promotion. People are always busy with their own interests in public groups. Don’t post frequently and don’t post direct links to the other groups. They might kick you out of the group. ➤No.3 Promote your offer: This is also a great tool to promote almost any kind of offline products on Facebook, locally or internationally. This is an opportunity for all kinds of small and medium size local business to get potential customer quite easily. Even if you are selling mobile SIM cards locally then, you can also pull many local customers to your store using this tool. But, first of all you need to create a Facebook page for that. ➤No.4 Drive potential customer to your business: Well, it’s an indirect method to make money on Facebook. If you own an online/offline business then, you can multiply your earnings by generating more customers using Facebook promotional tools (Facebook Ads). Nowadays, Facebook mostly focuses and improving its business promotional tools that any kind of business can promote their offers over the Facebook network easily. And, practically promotion of business is easier on Facebook than any other online promotional platform like AdWords. 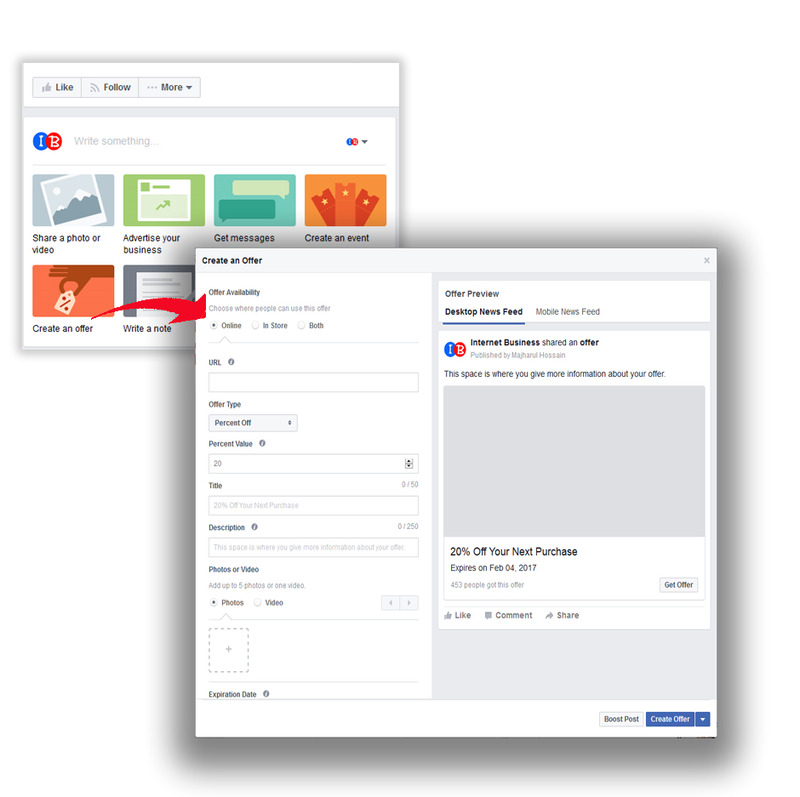 Once you create a business page on Facebook then, you’ll have a clear indication and demonstrate that how you can promote your business on Facebook yourself. Not only that, Facebook promotion is quite cheaper than others. Facebook is a social media, so create your offer with social tone instead of business tone. Call to action type ads are working best in Facebook. So, put a contact number within your ads. Target interest and location mostly. ➤No.5 Brand your own projects: There is no other online platform where you can establish your business reputation and give it a social identity. It may look like that there is no relation to making money on Facebook and branding a business! But, it’s the actual way to use the Facebook platform for making a huge revenue for the lifetime. You can promote every single type of products or service separately using Groups and Facebook Advertisements but, it might cause loss of reputation once your post start generating negative comments👎. So, it’s better to make awareness first that people can reorganise your products instantly. So, first of all generate “Likes” 👍which will represent your business reputation among the people on the web. « How Does Fake Reviews Works on eCommerce Sites; How to Spot Them	» A Few Most Common Fake Online Jobs; Beware of It!